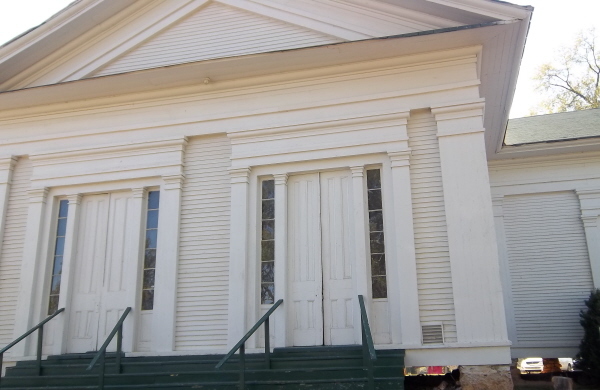 A North Georgia Chrysanthemum Show, Brunswick Stew, and a History Lesson. – Johntheplantman's stories, musings, and gardening. 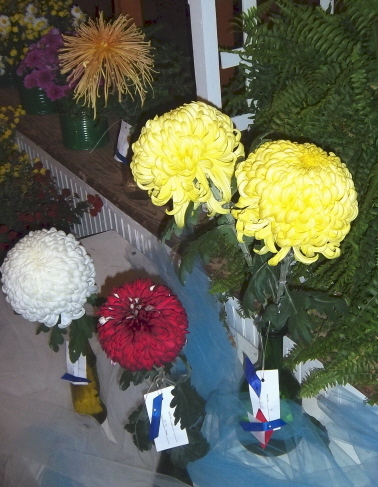 A North Georgia Chrysanthemum Show, Brunswick Stew, and a History Lesson. Posted byJohn P.Schulz	 November 4, 2012 May 26, 2014 3 Comments on A North Georgia Chrysanthemum Show, Brunswick Stew, and a History Lesson. 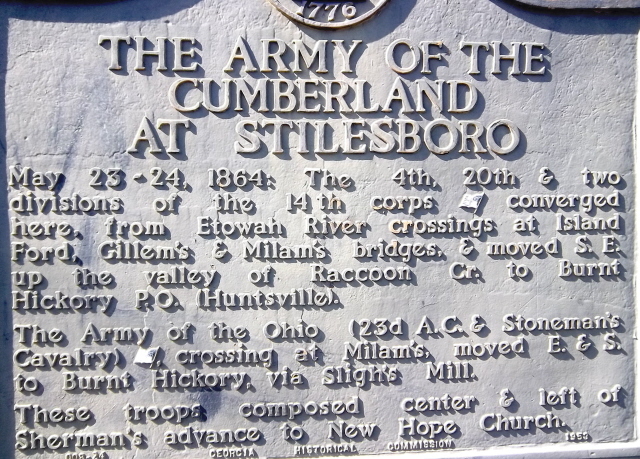 We didn’t know that we were going on an historical adventure when we decided to go to the Stilesboro Improvement Club’s Centennial Celebration Chrysanthemum show. We took the back roads through some pleasing farm land. The cotton had just been harvested and the old homes and surroundings took us back in time. 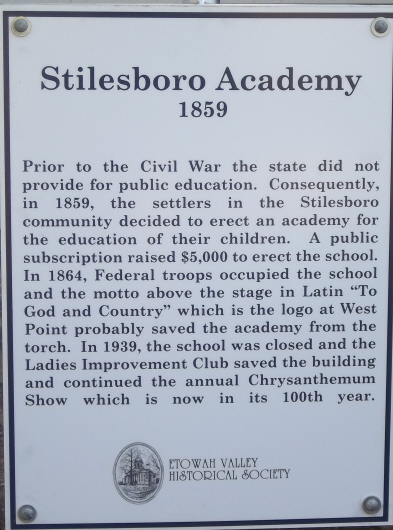 Stilesboro Academy, Just outside of Cartersville, Ga.
We took a break to eat and I pronounced the Brunswick stew some of the best ever—and I consider myself a well-informed judge. As to the flowers, though, I was familiar with growing the show flowers but I wanted to find out a bit more about what was going on. I’m still without a voice, but my wife Dekie is very helpful and patient in assisting me with an interview. It was not difficult to find help. We met Jan and LeeRoy Shepherd. 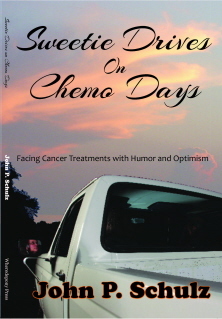 Jan, LeeRoy Shepherd and a jar of Brunswick Stew. I found out right off that LeeRoy was the “Stewmaster” and had put together gallons and gallons of the wonderful Brunswick stew. I told him how impressed I was with it. Jan was very helpful in offering us a history of the show as well as giving me information on the growing of the flowers. I was told that the ladies of the organization ordered rooted cuttings in the spring and grew them carefully. A process called disbudding is used on the plants, removing all but one flower bud as the plant grows in order to increase the size and vigor of that one flower. 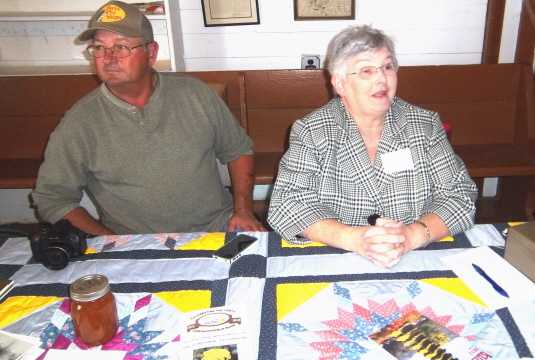 I remarked that they do the same thing to produce prize winning watermelons and pumpkins. She agreed. When I asked about varieties, Jan gave me a catalogue from Kings Mums and told me this was the company they ordered their cuttings from every year and that the catalogue was full of information. I found a page on King’s Mums website that showed me the flowers by class and variety. 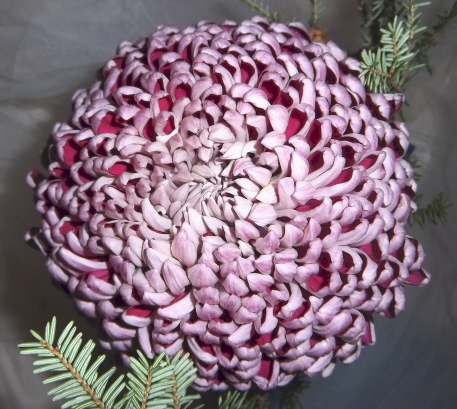 If you are interested in seeing a variety of impressive flowers, click here to go to King’s Mums page on “Cultivars”. I clicked on the pictures and enjoyed the show. 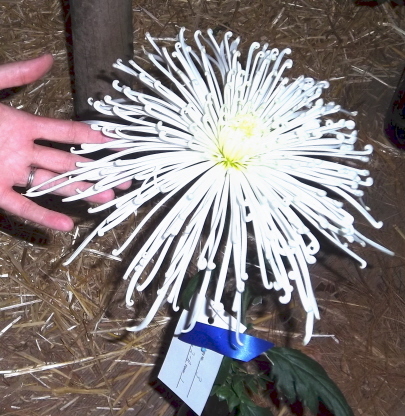 This is a centennial celebration of the chrysanthemum show. Miss Campie Hawkins is credited with having originated the idea for the first chrysanthemum show in the state of Georgia in 1912. 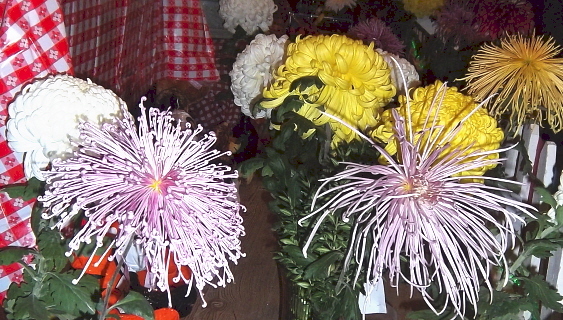 This annual chrysanthemum show is known as the oldest continuously held show of its kind in the state of Georgia. Jan Shepherd told me that the worst enemy of the large flowers was the grasshopper. She said that there have been quite a few instances of a carefully tended flower bud being eaten just before it opened. I could imagine the dismay with which one could watch months of careful attention turn into a meal for a grasshopper. 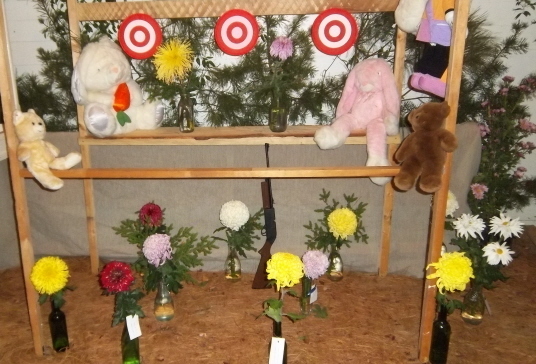 That didn’t happen to the flowers pictured here, though. 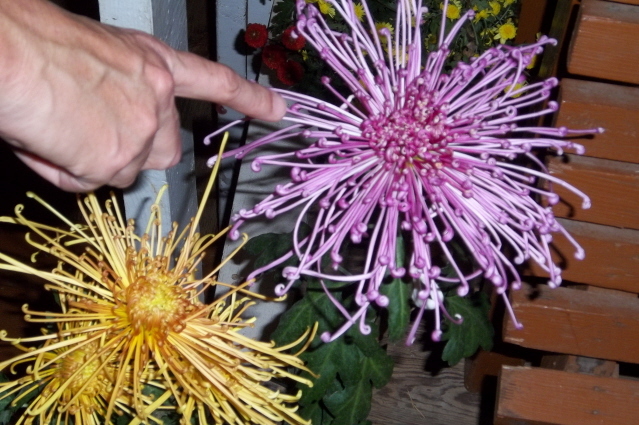 You may wish to click the link review a related article on perennial garden mums from the first of October. John, you did a great job conveying this awesome affair! These ladies, (and a few men) through these many years have prioritized their time and dedication to making this memory-making event a famed occasion. It was good to see your and Dekie’s interest by your attendance…. 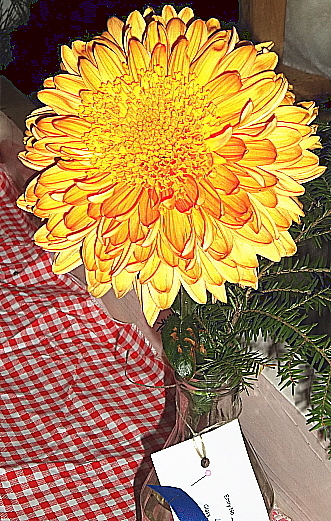 ________________________________ From: johntheplantman’s Landscaping Ideas from a Veteran Gardener To: samsspec@bellsouth.net Sent: Sun, November 4, 2012 11:33:31 AM Subject: [New post] A North Georgia Chrysanthemum Show, Brunswick Stew, and a History Lesson.